Russia is showing signs of mission creep in Syria. In September 2015, Russia began a military campaign to support the regime of Bashar Assad in Syria. Russia had a number of goals for the campaign: to crush the Islamic State, preserve a key ally in the Middle East and appear strong to the Russian public. But nearly three years later, the war continues, and Russia hasn’t found a way out of it. As jihadist groups in the country appear to be weakening, Russia’s motivations for staying in Syria are shifting. It wants to establish a regional balance of power and ensure that, when the civil war subsides, it still has ways to limit the reach of its historical adversaries – mainly Turkey but also Iran. Assad will play a role in this, but it is looking ever more likely that the Syrian Kurds will as well. Russia’s position in Syria is inevitably affected by another stalwart Assad ally, Iran. With substantial influence over the regimes in Iraq and Syria and its support for Houthi rebels in Yemen and Hezbollah in Lebanon, Iran has a formidable presence throughout the Middle East. This threatens to disrupt the balance of power that Russia wants to see in the region. But Iran is facing pressure at home, with the unraveling of the nuclear deal and protests since January over the struggling currency and deteriorating economic conditions. And even though they support the same side in Syria, Iran’s losses could be Russia’s gains. U.S. sanctions on Iran, set to take effect in early August, could give Moscow a larger share of the international oil market. 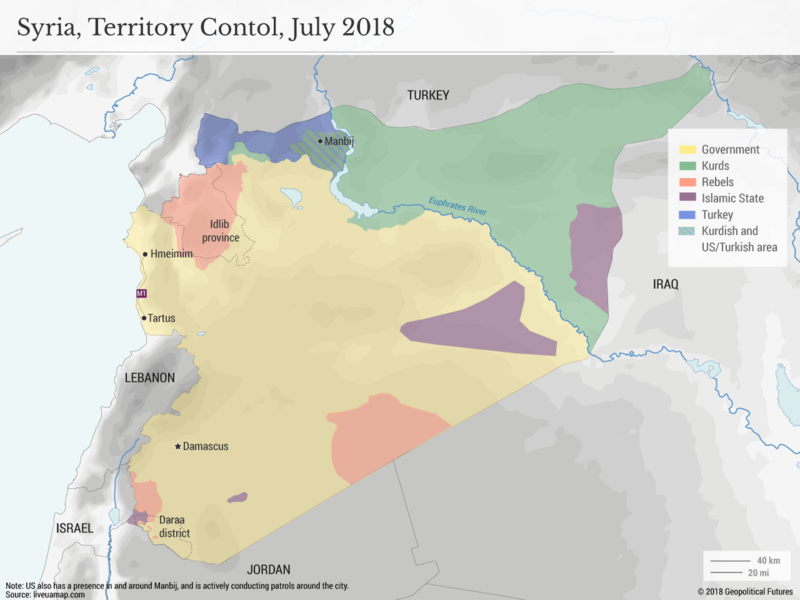 Though sanctions could limit Iran’s capacity to support Assad due to declining finances, the Syrian regime’s military needs are likely to change anyway, from offensive to defensive capabilities, as it shifts its focus from retaking territory to holding territory. The need for Iranian support, therefore, may become less critical than it once was. The remaining pockets of anti-Assad resistance are in the southwestern province of Daraa and the northern province of Idlib. Even if Iranian support diminishes, Russia is prepared to offer Assad air support in these battles because it can’t risk letting the regime fall and having jihadists retake large swaths of Syria – and possibly encouraging jihadists in parts of Russia. A smaller Iranian presence could also make Assad more dependent on Russia and, therefore, more likely to act in Russia’s interests. And Russia has another reason to support the Kurds in Syria: They could give Moscow a way to push back against Turkey and Iran in another key region, the Caucasus. Turkey designated the Kurdistan Workers’ Party, or PKK, a terrorist organization, and it sees the group as its most immediate security threat. Aligning with Kurdish groups would give Russia leverage over Turkey and Iran, both of which have the power to destabilize the South Caucasus along Russia’s southern border. Russia, Iran and Turkey have all fought for control over the Caucasus. Most recently, in the early 1990s, Turkey and Russia nearly confronted each other directly in the Nagorno-Karabakh War. When Armenia threatened to invade Nakhchivan (an exclave of Azerbaijan surrounded by Armenia, Iran and Turkey), Turkey sent thousands of troops to the Armenian border to deter the invasion. Russia responded by sending thousands of its own troops to the other side of the Turkish-Armenian border. Then Russia went a step further, proposing the establishment of an exiled Kurdish parliament in Russia. Turkey responded by throwing its support behind Chechen insurgents in Russia. In 2005, the two countries agreed to stop supporting insurgent groups in each other’s territory, but it’s clear from this example that Turkey is a threat to Russia in the Caucasus. Russia, then, could use the Syrian Kurds to keep Turkey in check. In theory, the same goal could also be accomplished through a unified, Assad-controlled Syria – which was Russia’s strategy in the Cold War. But this has some drawbacks. If Assad were to take full control of Syria, he’d have greater independence of action, and thus could refuse Russian requests to push back against the Turks. But if Kurdish groups in the north retained a semi-autonomous state with Russian support, these groups would be beholden to Moscow, and Assad would have to risk a confrontation with Russia to dislodge them, a maneuver he likely wouldn’t try. The remaining SDF forces in northern and eastern Syria are now likely wondering what will happen when they, too, are no longer strategically useful to the United States. Washington still needs to maintain good relations with Ankara, in part to maintain access to Incirlik air base. As the U.S. continues to look for a way out of Syria, Russia will quietly step up cooperation with or support of the YPG so that it is well-positioned in the event of a complete American withdrawal. Why, though, did the U.S. abandon the SDF in Manbij? America’s interests in Syria are narrower than Russia’s. The U.S. wants to eliminate the Islamic State, and while IS hasn’t disappeared altogether, it has lost almost all the territory it held in the Middle East. As the U.S. reassesses its global commitments, it will be increasingly inclined to limit its presence in Syria – and, therefore, its support of the SDF – if it appears that regional actors are capable of keeping IS in check. This is what the YPG fears, and what Russia is waiting for. We can’t talk about Russian interests in Syria without mentioning the naval base at Tartus. The base is in a strategic location on the coast of the Mediterranean. But it has some disadvantages. Based on a 2016 agreement with Syria, Russia is allowed to dock only 11 warships there, limiting the amount of force it can project from that location. Russia also faces supply problems. It can supply the base by sea either through the Black Sea via the Bosporus (which is controlled by Turkey); through the Atlantic Ocean via the Strait of Gibraltar (which is controlled by Britain); or through the Indian Ocean via the Red Sea and the Suez Canal (which is controlled by Egypt). Russia could also supply Tartus by air, but this would be costly and would limit the number of supplies it could send. In late 2017, Russia announced that it will be making the Russian Hmeimim air base in Latakia province a permanent installation. Hmeimim is only about 40 miles (65 kilometers) north of Tartus and directly accessible via the M1 highway, which runs parallel to Syria’s Mediterranean coast. A naval base south of the Bosporus that’s allowed to dock a limited number of ships and faces supply challenges provides a small boost to Russia’s power projection capabilities but wouldn’t be a huge help if Turkey were to close the Bosporus and cut off Russian access to the Mediterranean. Still, having naval assets on both sides of the Bosporus is strategically valuable, especially considering that the Bosporus played a key role in the Russo-Turkish wars of the 18th and 19th centuries, as the Russian Empire grew more powerful and sought greater access to the rest of the world. Like most things in the Middle East, Russian interests in Syria are complicated – which explains why Russia is showing signs of mission creep there. Its goal has gone from propping up the Assad regime to establishing a balance of power in the Middle East. This is where most foreign powers go wrong: Russia in Afghanistan, or the U.S. in Afghanistan and Iraq. Russia could easily get bogged down in a conflict it can’t control. The question now is whether Russia could handle the type of quagmire that the U.S. faced in Iraq. Time will tell.